Thankfully Instagram isn’t just about millennials showing off their ‘better than you’ loves or pictures of food, it has become a show room for the creative work of all sorts of artists and landscape and cityscape photographers. Among the many of high res generic images of London, you’ll find some great photographers of the city that make you look at it and the people differently. The Instagram account spicy.meatball is one such account. Spicy.meatball shares his ‘London Street Photography’ with his 3,100+ followers giving them a new perspective on the city. His work captures those private yet public moments of calm, celebration, joy and sadness we all experience on a daily basis, against the backdrop of a city that for all its grey is shown to be full of colour and fun. 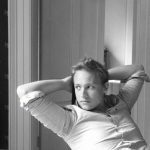 We decided to sit down with spicy.meatball, or Josh Edgoose as he is otherwise know, and find out more about the 28 year old’s photography, what he looks for in his images, and what, after 10 years living in London, he loves about the city. Firstly how long have you been taking images of London and its inhabitants? Well I’d say about 18 months now I think, although I’ve only really started carrying my camera everywhere with me for the last 6 months as I was getting frustrated about missing shots, really wish I’d started doing that sooner. I studied photography when I was a teenager but I didn’t really get on with the ‘structure’ of it, we had to shoot 5 rolls of film a week and it became a bit of a chore, I also didn’t really know how to use a camera properly. I started a business a few years later and had to buy a DSLR to take product shots around different locations in London. I then found myself taking pictures of people and as a result ended up picking up some of the street photography books I had looked at whilst studying photography 10 years prior. I started travelling to New York regularly and noticed some of Daniel Arnold’s work which made me realise if you spend enough time on the street just taking in everything , something interesting, funny or quite sad will come your way. I also really like walking, it’s very therapeutic. For me at least. So what attracted you to photographing people and London? I’ve lived in London for nearly 10 years now and I was finding myself becoming quite lazy about travelling into Central London as it were. Just going out for a walk with a camera is not only great exercise but there’s always something going on, somewhere new to eat, some interesting character doing something weird. Clearly it’s not just as simple as going out, pointing your camera and then getting a great image from it. So what do you tend to look for to make in your compositions? I like a nice flow of people that aren’t overlapping or colours that complement each other. Sometimes an interesting gesture. Anything that makes you want to look at a picture for more than a second or two. You mention the work of Daniel Arnold inspiring you, and I imagine you admire the work of other photographers. What’s your favourite image? There’s a picture that Gary Winogrand took in Dallas in 1964 of where Kennedy was shot, there’s a lot to take in. How about your favourite picture that you’ve taken? My favourite picture is the wide one with the couple and the pigeons. 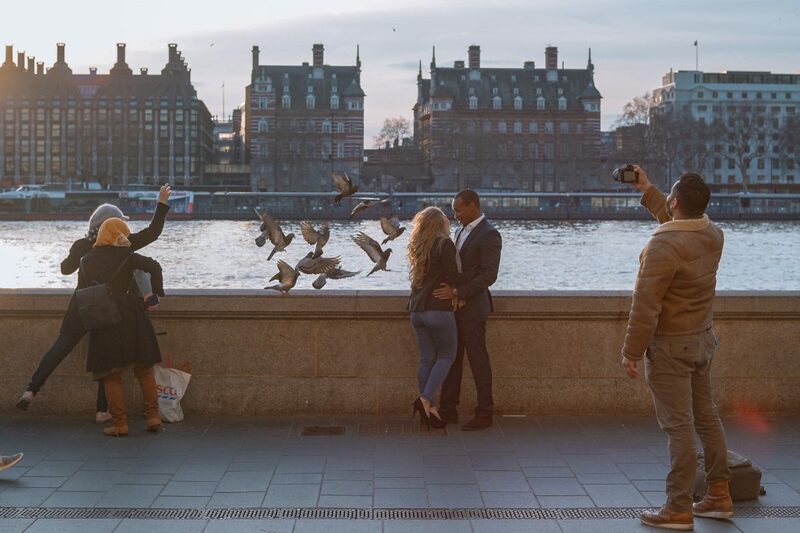 The guy taking the couple’s picture was recruiting passers by to scare the pigeons so they would be in the background of his shot. He heard my shutter going behind them and recruited me to help scare them too… I think it’s a fun shot as there’s a few different elements going on. The equipment you use must give your images a certain quality. What camera do you use? Do you have to touch up your images to help draw out the vibrancy of London and the people? I use a Fuj X100F for shooting during the day and a Sony A7II with a vintage Leica lens for shooting at night. Autofocus doesn’t really work very well in dark conditions so I’ve gotten used to focussing manually and it’s nice to mix it up a bit. I edit everything in Lightroom; I used to really overdo it but now I just do a few adjustments to the exposure, shadows and temperature. I’m sure there’s a lot more I can do in Lightroom but I don’t really know how to use it. When taking pictures of people do you find they tend to mind or do you ask their permission? I don’t ever ask permission. No one ever minds. People are too busy with their own lives to really care. Occasionally people have asked if I just took their picture and I normally say ‘yes, I thought you looked cool ‘and I show them the picture, they’re usually like ‘oh yeah, I do look cool.’ That hasn’t happened for a while now. Engaging with the city as you do, it must give you a very different take on it. What have you learned about London and its inhabitants? I’ve found people very friendly for the most part; you do end up chatting with people every now and again, though I get asked for directions more than anything. What makes London such a good canvas to take photos? The architecture and interesting signage. It’s one thing to have a good subject but London provides some really interesting backdrops, which help to ’round off’ a picture as it were. What are your favourite conditions for taking picture in? You seem to be out in all weathers. I do love the reflections that rain creates and the harsh shadows when the sun is fully out. Cloudy days are a bit of a challenge. The snow we had recently was fun but my hands were ruined after that. I imagine that given the breath of the locations in your work you have got to see more of the city than many of us ever manage. Have you got a favourite area of London to take pictures? I like Portobello Road market although it can get very busy. Lots of interesting outfits though. I could stand in Piccadilly Circus for hours; Mayfair and Soho are also great.